Let's get to the meat of the matter right out of the gate - here's my bracket. Mark Armstrong's bracket (with some help from Luke). It says Luke on the upper left because in our family/friends competition, I've teamed up with my nearly 3-year-old youngest son. He handles the advanced analytics and statistical number crunching, while I rely mostly on gut feeling. He also frequently hangs up when I'm trying to FaceTime with him, his brothers and my wife. Mark Armstrong's secret weapon for the NCAA bracket. I've sworn to never doubt Tony Bennett and the Hoos ever again. I will vote them to finish first in the ACC next year regardless of roster turnover. They are a machine. So why am I picking them to lose to Arizona in the South Region? Easy - I'm a prisoner of the moment and when the news hit Tuesday that star sixth man De'Andre Hunter would miss the tournament with a broken wrist, I probably overreacted. That said, Sean Miller has a coterie of NBA guys in the desert, led by Bahamanian big man DeAndre Ayton, who's basically Patrick Ewing circa 2018. My early upset pick -- Peyton Aldridge and Davidson sending UK home early. No surprises from me in the East Region. I've got Jalen Brunson, Mikal Bridges and those immaculately tailored suits of Jay Wright advancing to San Antonio. There was one erasure as you can see where I was tempted to go with Collin Sexton and Alabama over Virginia Tech in the opening round. I had second thoughts as my love of Buzz Williams won out. Upset pick here: Florida over Texas Tech and Purdue. The Gators looked so good early in the season. I'm banking on them rediscovering some magic. Things obviously get more locally interesting in the Midwest. NC State should hopefully handle Seton Hall in the opener, though that's an 8/9 game for a reason. Omer Yurtseven and the Pack frontline will have its hands full with Angel Delgado and Desi Rodriguez. I like the Pack's guards more though. I'm tempted to ride the Pack upset over Kansas too, but can't pull the trigger. This is a beatable Kansas team despite the brilliance of local product Devonte Graham, but I don't think this is the year for Keatts' team to really make a tournament splash. I've got Duke advancing all the way to San Antonio. The Blue Devils have the most talent in the country and in a wide open field, I'll take the likes of Bagley and Carter to the bank. The only minor upset -- I have Syracuse winning in Dayton and then advancing past TCU. Bit of a homer pick as Orange frosh Oshae Brissett is from my hometown. I'll be with the Tar Heels as they advance through the bracket and while nothing is easy, I think we'd be lying if we said things didn't look relatively friendly for them. They're in with the easiest 1 seed, Xavier, and I don't see a team outside Gonzaga that the Heels should fear. Getting out of Charlotte, to me, should be pain free, and while Michigan is playing very well, the Heels already own a win over the Wolverines. The title game rematch in the regional final in LA should be a doozy, but I've got Roy's boys squeaking past the Zags one more time to get to the Alamo. Alas - I foresee the brilliant careers of Joel Berry and Theo Pinson winding up in the National Semi vs Arizona. This again has everything to do with DeAndre Ayton, and a dash of Allonzo Trier and Rawle Alkins. 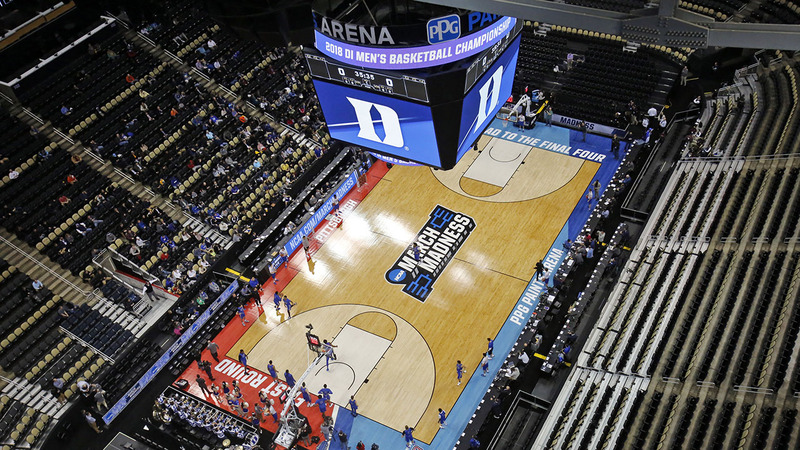 Duke will either get carved up by Nova's offensive efficiency or rise to the occasion. My bet's on the latter, and why not, gimme the Devils to beat the Wildcats for the title too. San Antonio doesn't end in 'apolis' like every other Duke title town, but that streak has to end at some point. Of course - Xavier's no guarantee to make it out of its first game as they will undoubtedly face NC Central. The smart money here has LeVelle Moton's Eagles advancing out of Dayton with a mythical HBCU National Championship thanks to a win over Texas Southern. Raasean Davis controls the paint. Book it.